The Oakland County Parks and Recreation Commission (OCPRC) partnered with the Road Commission for Oakland County (RCOC) to create wetland within the Lyon Oaks County Park that will serve as mitigation for wetland impacts associated with RCOC projects. The purpose of the project was to construct approximately 13 acres of wetland mitigation for past and future RCOC transportation projects while providing a valuable recreational and educational resource for the public and Oakland County Parks. In addition, the disturbed upland field immediately northeast of the mitigation wetland was converted to 7 acres of high-quality prairie, which not only offers a significant natural buffer to the wetland, but also provides crucial habitat and winter cover for the abundant wildlife that inhabits the park. Niswander Environmental completed a site investigation and developed a mitigation design including earthwork and planting plan for the wetland mitigation site and surrounding prairie. Niswander Environmental also completed a detailed hydrologic budget to ensure the feasibility of the design. The wetland design utilized a low-head berm with a water control structure that impedes surface water from leaving the site. The mitigation site was designed as an emergent and wet meadow wetland that incorporates areas of saturated soils, dense vegetation, and significant woody structure, all of which create diverse microhabitat that is valuable to a variety of wildlife that inhabits the general area. Construction of the wetland and prairie was completed in October 2007, with seeding of the wetland basin, berm, and prairie completed immediately thereafter. Niswander Environmental was present on-site during critical construction periods, including rough and finish grading, topsoil placement, installation of the water control structure, habitat structure placement, and seeding. 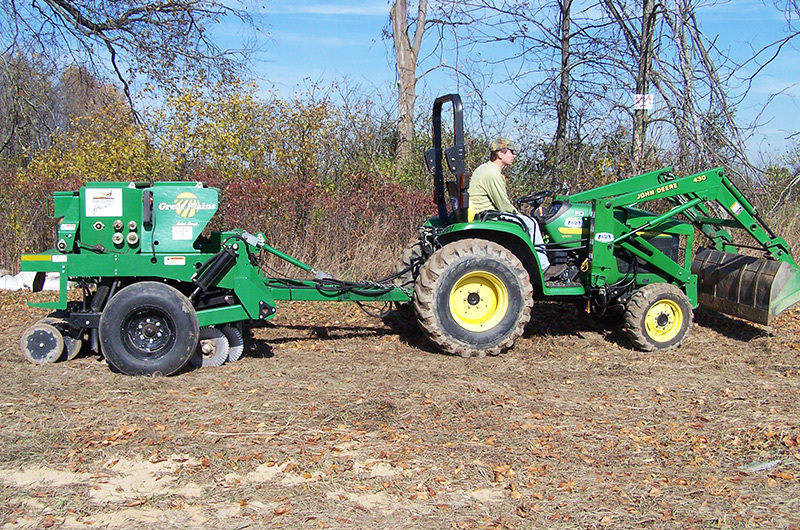 Niswander Environmental personally installed soil erosion and sedimentation control measures around the perimeter of the site prior to construction, and personally seeded both the wetland and prairie portions using a no-till drill following construction. The wetland system and associated prairie provides essential habitat for the wildlife that inhabits Lyon Oaks County Park in the form of feeding, nesting, brood rearing, and winter cover. Although a majority of the mitigation wetland is densely vegetated with wetland plants, seasonal open water provides loafing areas for waterfowl such as mallards and wood ducks. With the amount of frogs, tadpoles and insects present in the wetland, this area also provides excellent hunting opportunities for predatory shorebirds such as great blue herons, egrets, kingfishers, and green herons. While the wetland offers diverse habitat for wetland-dependant wildlife (i.e., amphibians, waterfowl, etc. ), the adjacent prairie offers similar habitat for upland wildlife. Pheasant, quail, deer, rabbit and turkey, as well predators such as snakes, hawks, coyotes, and fox use this area as well as the wetland for both food and shelter. The site serves to educate the public on wetland and prairie habitats. The variety of textures and colors inherent in the vegetation adds beauty to the site. It is anticipated that this area will incorporate the existing trail system that provides recreational opportunities such as hiking, hunting, bird watching, and nature study. Niswander Environmental monitored and managed this mitigation site from 2008 – 2013, and has implemented an aggressive invasive species control plan to suppress reed canary grass.